Where possible, I’ve listed an online retailer, but some of the generic items may require searching. 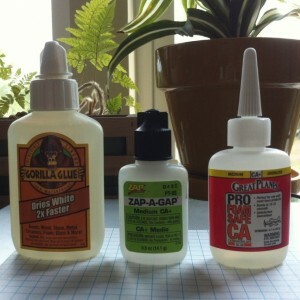 The Gorilla glue requires a wet surface, several hours to dry and the expansion makes it unsuitable (and messy) for precision work. Zap-A-Gap does not produce much heat, but I decided to go with the Great Plains to prevent the issue of melting elapor foam. The motor and servos are wrapped in electrical tape so that they can be salvaged without much glue remaining on the surface. 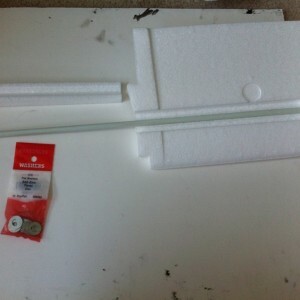 The parts in the EasyStar kit I received are very well made with only one piece warped by shipping. The bent empennage does not matter much because we’ll be replacing the rudder anyway. 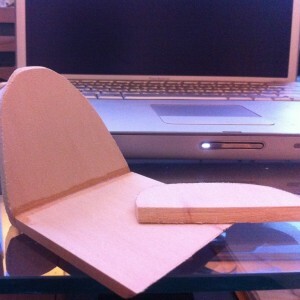 This is what the tail fin looks like with the rudder removed, and after correction with hot air. 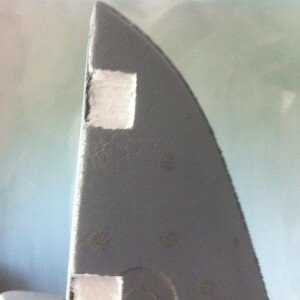 A hair dryer (or a very low setting heat gun) will work. Ease off on the heat before you see the bubbling in this picture. Use the same technique on the wings to reduce the effective dihedral angle from the upward cant of the polyhedral wings. This step is optional, but I plan on adding ailerons at a later time, and the dihedral will tend to roll the plane towards level, minimizing the control effect of the ailerons. 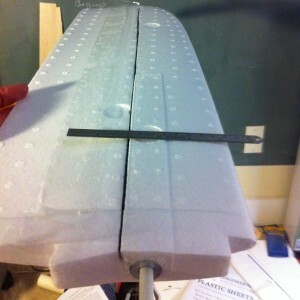 One of the very common Easy Star modification is to create a new, larger rudder. 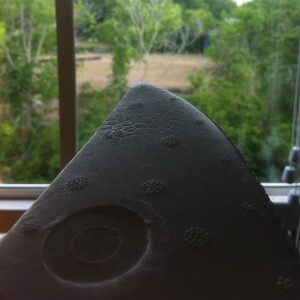 You can use the existing piece as a template, and even reuse the control horns that come with the kit. 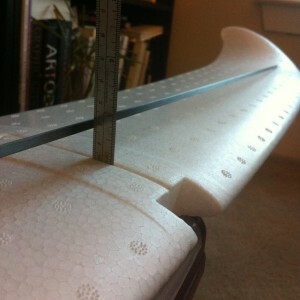 2.5mm tube on trailing edge of the elapor, where the rudder will be mounted. 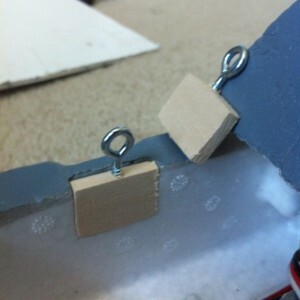 Cut the groove with an X-acto knife and use clamps to hold the CF while the CA glue cures. Use similar steps for the other CF pieces. The fuselage needs large amounts of foam removed to accommodate the CF tube, and on old soldering iron works well for this. Inlay the CF tube on the underside of the elevator surface. 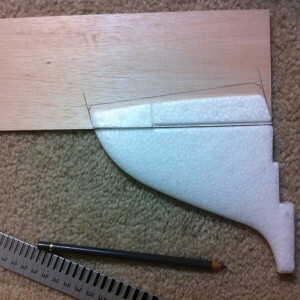 Start the CF strip on the wings at the join used to cover the main spar. After inserting the wing spar that comes with the kit, cut out a section need to join to inlay a washer, which prevents the spar from warping the wing joint over time. You can see the edge of the CF tube on the tail fin here (after painting), as well as the cut-outs for the hinges to the new rudder. 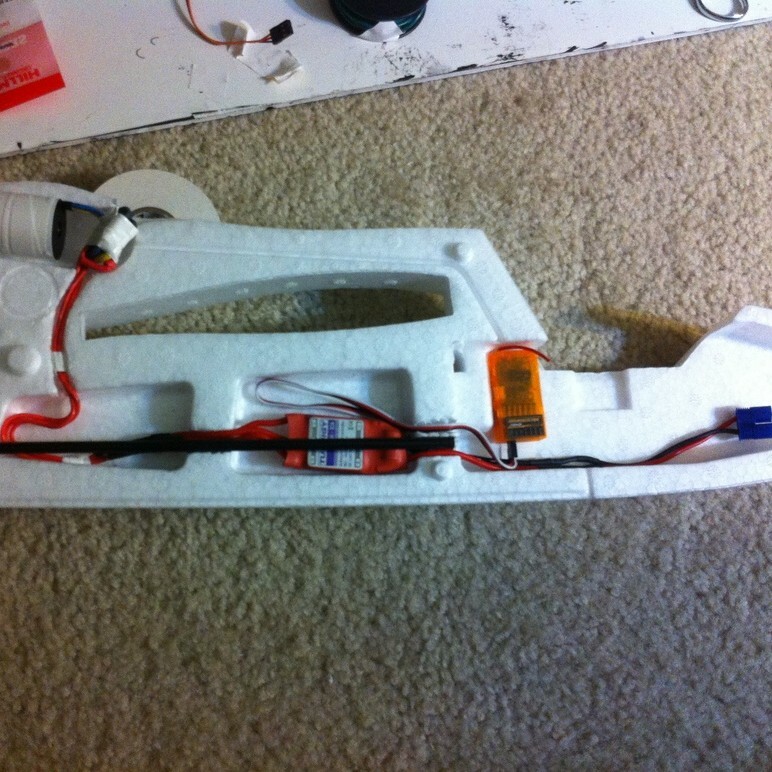 The wiring is routed through channels carved with a soldering iron, and 12g wire is used to connect the brushless motor the the ESC. The Orange Rx has since been replaced with a FrSky TFR6, and the blue EC3 connectors with XT60 connectors. The ESC is snug between the CF spar and the fuselage. If overheating is a issue, I will need to cut an access hatch later. 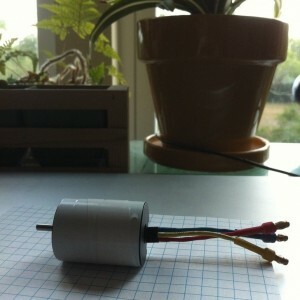 Wiring a brushless motor is easier than it would seem for three-wire design. Just connect the wires and if the motor spins the wrong way, switch any two wires. Take a look at the wiring diagram to see why this works. On disadvantage of placing the wiring inside the fuselage — in addition to the lack of heat dissipation — is the inability to disconnect one of the wires, which would allow the motor to spin at reduced speed for testing purposes. The receiver (and battery) should be secured with velcro. Since I plan on using the plane as test bed, I made a replacement to the canopy our of basswood. 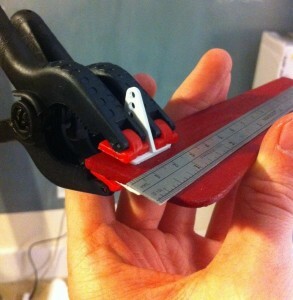 You can use the existing canopy on the plane as a template for the angles. 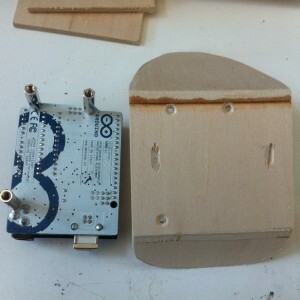 The holes will fit the standoffs for an Arduino Uno v3 and the slots are used to secure the canopy cover. The screws are drilled into the wood blocks, which are glued to the fuselage; a quarter-turn on the screws keeps the canopy on tight. Carbon fiber splinters are itchy. Err on the side of leaving the CF pieces intact. 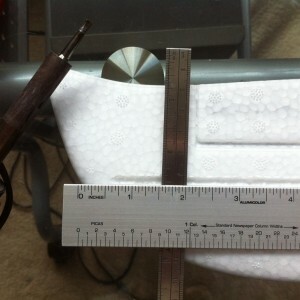 I cut one of the pieces, only to decide later to use a 2.5mm tube as a inner coupling to join them again. It is much easier to burn foam than to cut through the cells. The smell of burning styrofoam is nostalgia-inducing. CA glue will stay on your fingers for at least 36 hours. The wing join should be secured with the velco. After watching some crash videos on Youtube, most of the catastrophic failures of the Easy Star seem to be related to wing separation. 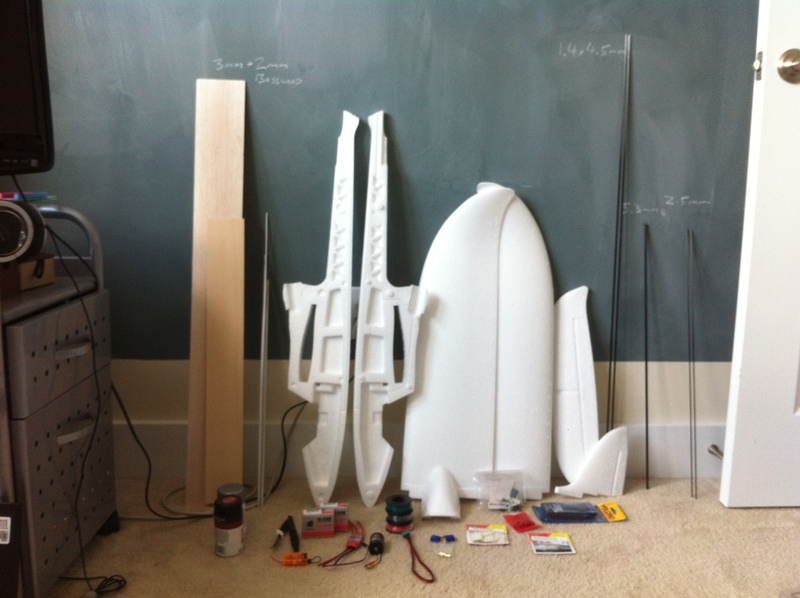 This build ended up tail heavy, and the initial test flights were barely controllable due to this. The center of gravity should be ~3-5cm from the leading edge of the wing; this required a 2200mAh lipo plus $6 dollars worth of quarters in ballast to correct. CA glue bonds to vinyl to paint much stronger than paint to elapor. Futaba radios need to have the throttle reversed. Apparently this is common knowledge. If you do not reverse the throttle channel, then the ESC will not arm or, if you manage to zero the throttle, the motor will appear to run at full when the throttle lever is at 0 position. Mounting the ESC inside the fuselage seemed like such an aerodynamically sound decision. Turns out that ESC generate a great deal of heat and have self-sensing throttles to prevent damage from that heat. 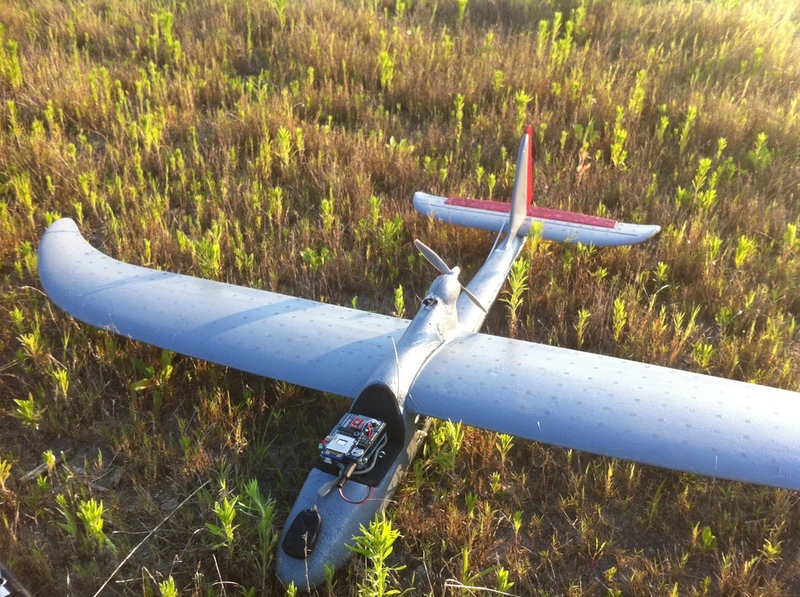 The post-flight videos had a clicking noise which would occur after 4-5 minutes of 60% throttle. I originally thought this was the motor overheating, but after cutting a vent into the fuselage, discovered that the ESC was just as hot.